What can we say? The S&P 500 Index futures (ES M1) are trading higher again this morning by 6.00 points to 1322.50 per contract. The S&P 500 futures have now rallied higher by 81.0 points in just 10 trading sessions. The rally higher has been on much lighter volume and this is certainly a concern for many traders and investors, however, price action is all that matters and it seems to climb regardless of the geopolitical events around the world. Last night the Asian markets were higher. The Nikkei 225 Index (Japan) rallied higher by 2.65 percent and lead the advance in Asia. The Hang Seng(Hong Kong) ended higher by 1.70 percent which was good for second best in the continent. The Sensex (India) climbed by 0.89 percent and continued it’s multi-day winning streak. The popular and highly followed Shanghai Index (China) was the only major Asian stock index to close lower by just 0.08 percent. The Asian rally last night is certainly helping the futures trade higher before the opening bell this morning. At 8:15 EST the ADP jobs report for March was released. The report said that the private sector added 201,000 new jobs in March. This number was exactly what analysts had expected. Last months ADP number was revised lower by 9k to 208,000 jobs. It still amazes me that with all the sophisticated computers that we have today that these number still have big revisions. Oil is trading basically flat this morning as the fighting in Libya remains escalated. Reports from the Middle East have said that Gaddafi forces have recaptured an oil rich region. Who can really keep up with this news or even know if it is worthy? Therefore, Just follow the chart on oil which is holding up very well at this time. Silver and gold are also trading higher with the major stock indexes. The U.S. Dollar Index is trading unchanged at the moment. Should the U.S. Dollar Index fade when the market opens this will usually help to inflate stocks and commodities. Leading bio-tech firm Cephalon Inc. (NASDAQ:CEPH) is being bought by Valeant Pharma International Inc. (NYSE:VRX) for $5.7 billion. 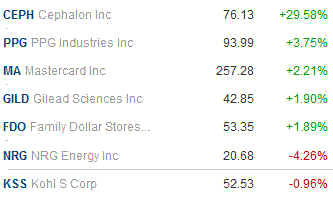 Other biotechnology stocks could catch a bid higher this morning on the news.